Floodwaters surged through Boston streets during a March Nor’easter. Nearly 19,000 structures were destroyed in the Camp Fire, which became California’s largest-ever wildfire just months after the previous record blaze. Hurricanes Florence and Michael flooded farms and flattened homes. It has been another year of devastating extreme weather events, and the number of these costly events is only rising with climate change. NOAA NCEI reported 11 weather and climate disasters with over $1 billion in damages through September (they report quarterly). When the final 2018 numbers are released in January, Hurricane Michael will be added as the 12th and other events could exceed the billion-dollar threshold. November’s individual wildfires will not count separately; according to NOAA lead analyst Adam Smith, “our analysis treats U.S. billion-dollar wildfire and drought events as regional-scale, seasonal events, not as multiple isolated events. Therefore, this year's Western wildfire analysis will again be treated as one event.” However, the cost of each fire will certainly be counted. Last year’s wildfires tripled the previous cost record, and this year’s total could eclipse the new record of $18 billion. Billion-dollar disasters are happening across the country, and climate change is often linked. By creating hot and dry conditions in the West, human-caused climate change has doubled the cumulative forest fire area burned since 1984. Warmer oceans are fueling the rapid intensification of hurricanes, while a warmer and wetter atmosphere intensifies their rainfall. A warmer atmosphere could also strengthen severe thunderstorms in the Plains and Midwest, although connections between wind shear and climate change are still being researched. 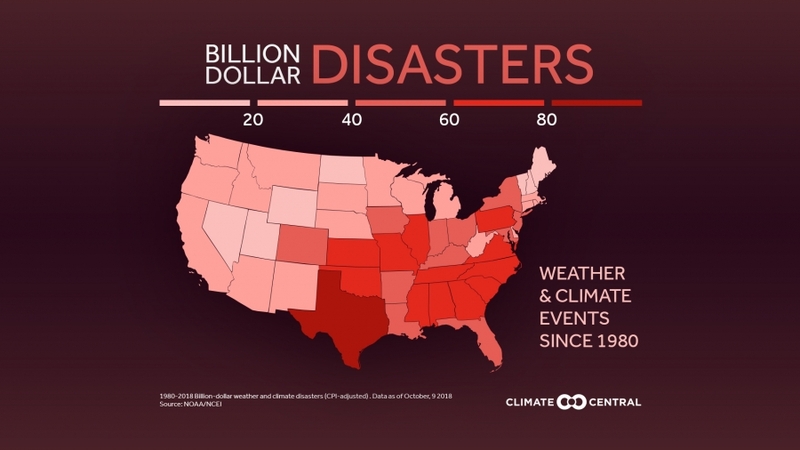 These weather and climate disasters are becoming more frequent and more costly. According to NOAA’s 2017 report, the seven years with the most billion-dollar disasters have all come in the last decade. Of the total inflation-adjusted costs since 1980, over 25 percent have come since 2015, including the record $312.7 billion in 2017. Costs can be reduced with climate adaptation measures, such as restoring coastal marshes, increasing the flood-preparedness of homes, and treating stressed vegetation in wildfire-prone areas. But according to the recent National Climate Assessment, climate change is still outpacing our planning. To minimize our risks, we must reduce our carbon emissions as quickly as possible. 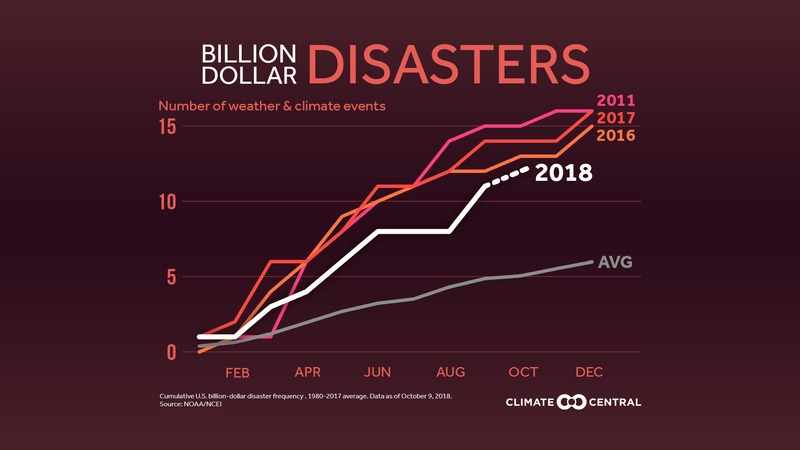 Methodology: Data comes from NOAA NCEI: U.S. Billion-Dollar Weather and Climate Disasters (1980 through October 9, 2018). The cost has been adjusted for inflation using the Consumer Price Index (CPI). The methodology developed by NOAA NCEI, with input from economic experts and consultants to remove biases, can be found at https://www.ncdc.noaa.gov/billions/overview. Additional review of the methodology can be found in Smith and Katz, 2013.